When I was in school and they would announce that we were going to have a snow day for the third day in a row, it was like winning the lottery! Now, the first day feels like a win, but by the third day I need to get out there and see the world! To keep myself busy these past couple of days I of course spent most of the time in the kitchen making soups and stews since that’s all that we were in the mood for. But, by the end of the third day, I ran out of items in my kitchen pantry. Even my fridge was emptied out! Thank goodness today looks like munchkin and I are going to hit the market – finally! 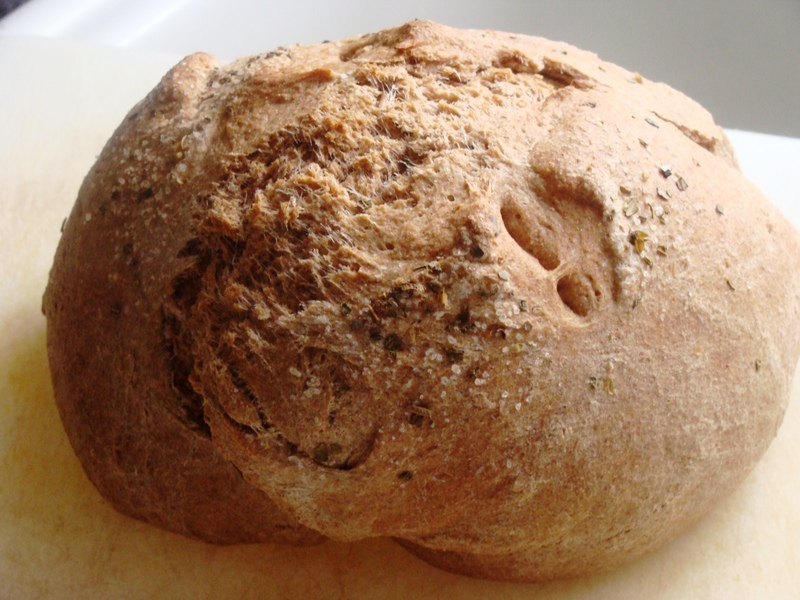 This bread that I made yesterday was out of pure necessity – I’m telling you, that kitchen pantry is empty. It’s a good thing that I buy flour in large quantities – when I bring the bag of flour home, my husband says that it looks like I’m preparing for doomsday…funny guy. It’s more like I’m preparing for him because he ends up eating most of the bread that I make. That loaf up there was gone in one sitting. I had one slice, and he and my daughter literally attacked it – they didn’t even use a knife to cut it. So is the reason why I don’t have a pretty picture with a few slices. This bread is my take on the country type bread served at steakhouses, only healthier. 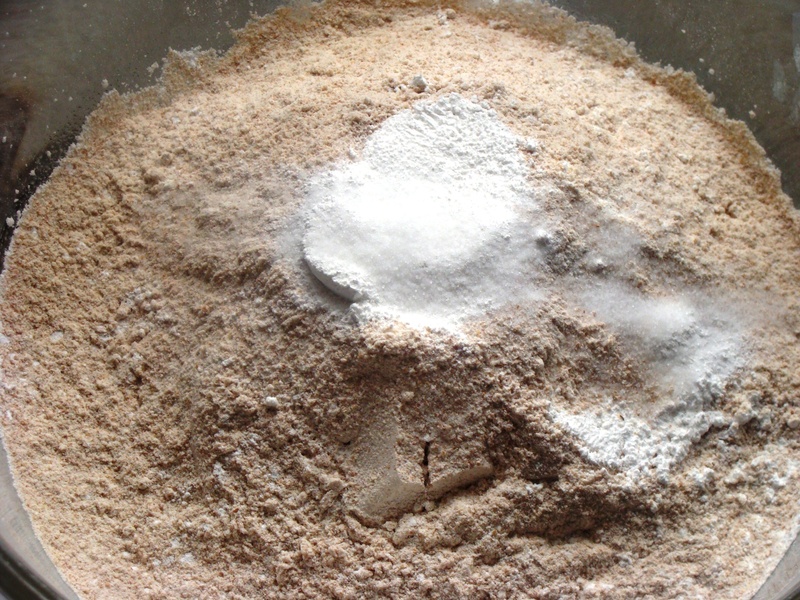 In a deep mixing bowl, mix your dry ingredients. 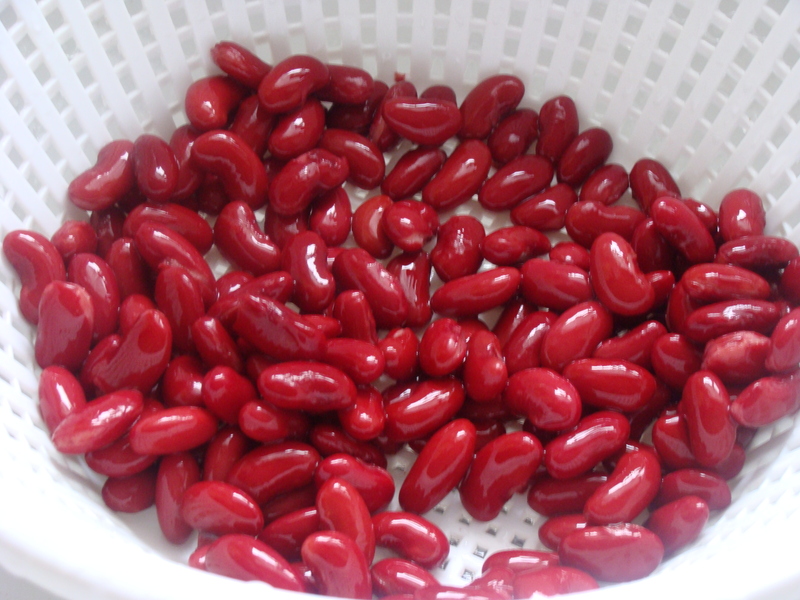 In a separate bowl, mix liquids and add to the dry ingredients. Depending on the humidity of the air where you live you may need more or less liquid. The dough should be moist but not sticky. It is important not to overwork the dough. Shape into a ball or an oval with oiled hands. 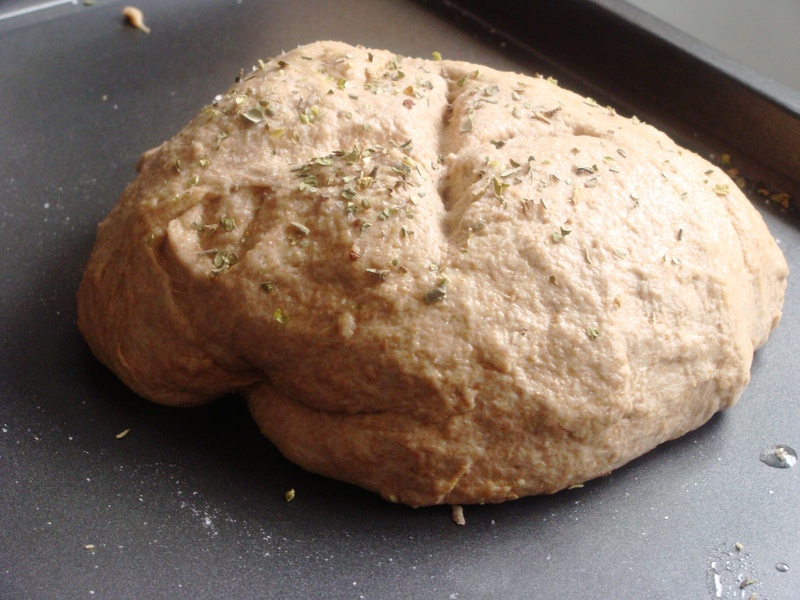 Rub the dough ball with EVOO and sprinkle sea salt and oregano. Lightly cut an X onto the surface to prevent splitting of the crust. Place on a clean baking sheet. But we can’t stop at just the bread! I have to show you my yummy soup that soaked up all of that bread! This is the “clean out your pantry” soup. 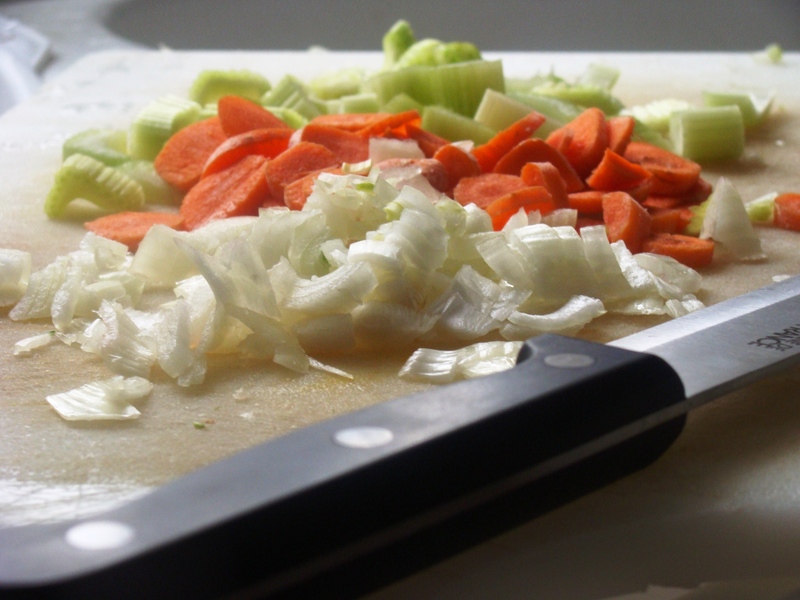 If you have an hour and some to spare, get out your chopping block and start cooking. In a large deep pot place in the onions, carrots and celery; sprinkle with 1/2 teaspoon sea salt, EVOO and mix with wooden spoon. 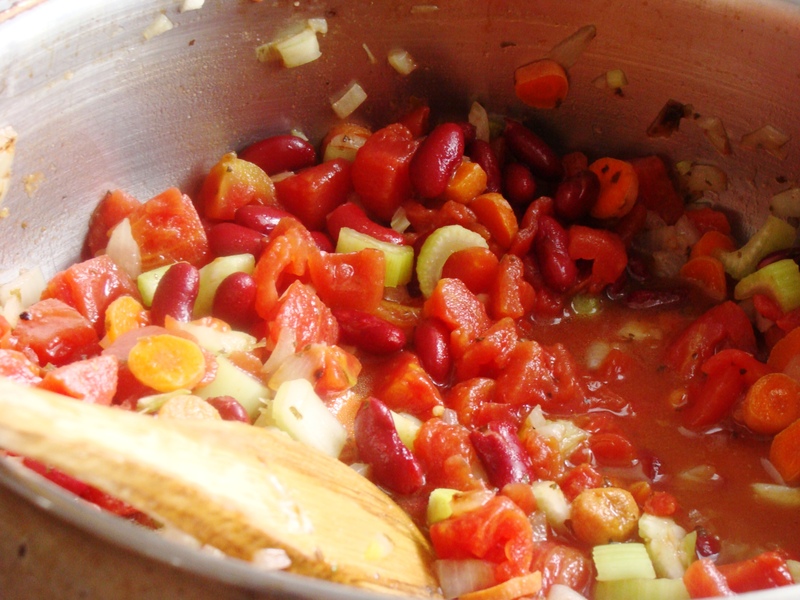 Allow to cook for about 10 minutes, or until the vegetables are softened, then add in the minced garlic, tomatoes, kidney beans, garlic powder, garlic salt, paprika, parsley, and basil; stir and cook for another 10 minutes on medium heat, or until the mixture begins to bubble. Pour in the water and turn up the heat to high and wait for it to boil. Add the bouillon cubes, mix well, and turn down the heat to a medium-low. 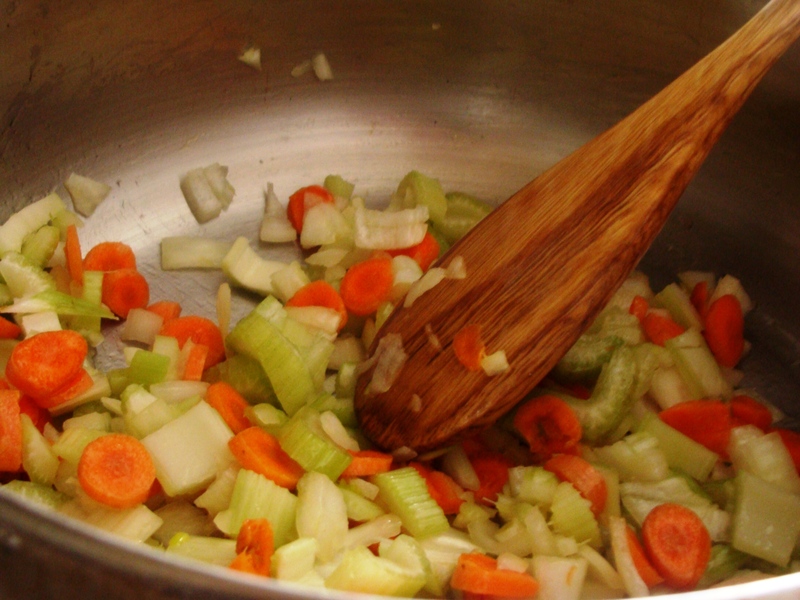 *You can skip the above two steps if you have six cups of vegetable broth on hand. Let it simmer for about 30 minutes then add in the elbow macaroni. Allow it to cook for another 10 minutes on medium heat before removing it from the stove. Serve it warm with a side of that bread! It was delicious! If I don’t want to use whole wheat will it come out the same way ? I would love a big bowl of that soup :). i need this bread and soup, right now! 😉 congrats on top 9! Such a beautiful loaf of bread. I love the smell of bread baking in the oven. I will make this soon! Thanks for the recipe. Congrats Kate on top 9…Great job!!!! What a great looking loaf of bread! It’s inspiring. I will have to make it soon! Oh that big mound of warm doughy goodness looks very tempting! Yummy! Love bread and soup on these cold winter days! Congrats on Top 9 that is a lovely bread and bowl of delicious soup! I am with your husband here would eat the whole loaf with your daughter before you can take the pictures! love bread!!!! 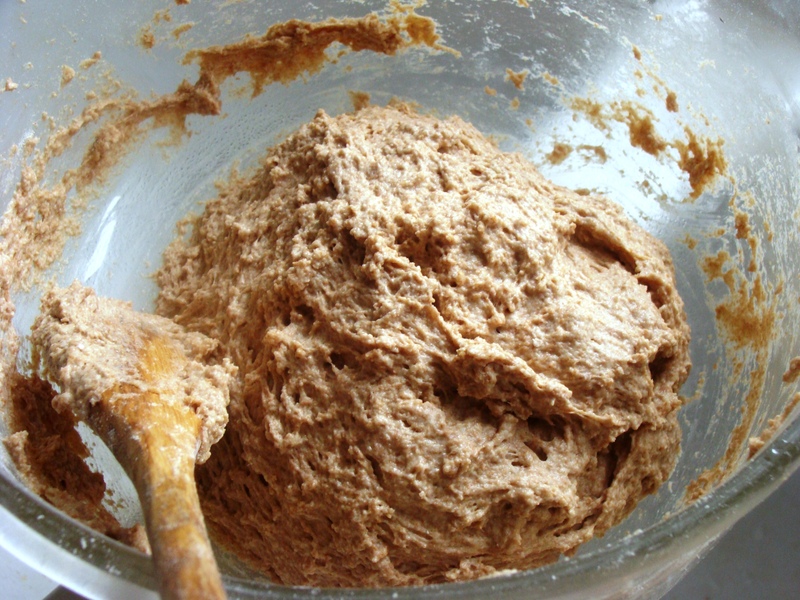 Love this – no yeast – yet it looks like rustic yeast loaf. I hope you get out of the snow soon before the pantry is completely dry! There is nothing better than the smell of homemade bread in the oven! Your loaf looks fantastic. Clean out the pantry meals make me feel good about braving the grocery store (and the snow) again! Stay warm and safe this weekend! Looks amazing, and so comforting in this cold weather. Good, solid recipes. I love hot soup on a cold day. I’m sooo not a baker, but I think I could handle this. I love homemade bread and I especially love that it is whole wheat! This looks like a simple recipe, I will have to try it very soon! This looks so perfect for a snow day! home made bread is heaven! we bake our own bread on a daily basis; it became a routine to have the entire house smelling like freshly baked bread. to ease up the process, we knead it in the bread machine and we bake it in the oven. the last one we made was with funghi porcini. A perfect meal for the cold snowy days! The bread looks extremely delicious! Okay, the bread looks great, but what puts it over the top is imagining sopping up the soup with it. Heaven. 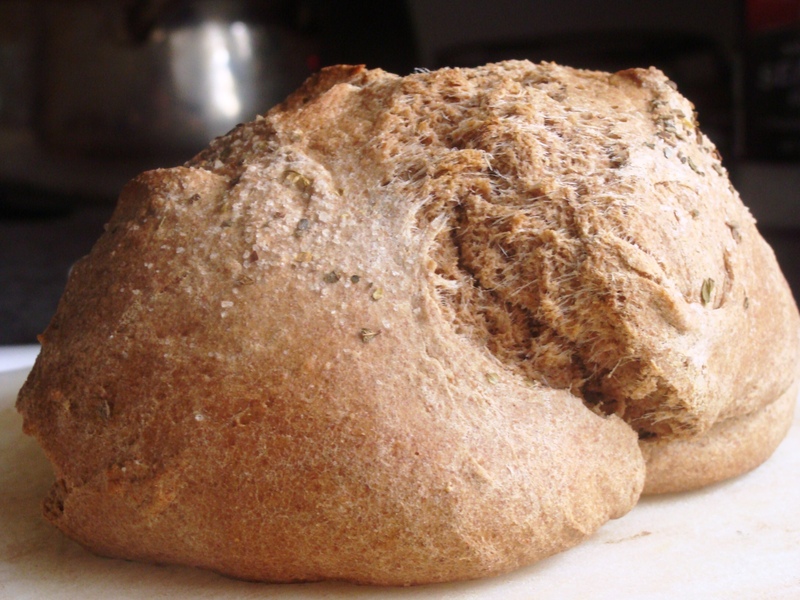 Kate, your homemade bread looks so delicious and and probably very pleasantly flavoured with the oregano added! I love this! its so perfect. I hardly bake bread but I love it so much its one of my favorite things. I used to at least put it in the oven every morning and bake it but making it was a little less often and now that I’m not in the Restaurant its even less but seeing this you’ve inspired me to give it a go once more. I have a hard time with dough in the winter through but i think i can take on the challenge. wow, no yeast! I love soda bread b/c it’s so fuss free. I hope the weather gets better where you live. I can’t wait for better weather … staying in for so many days in a row gets kinda depressing. You sound just like me! We were “snowed” in for 3 days simply because the plows didn’t come and remove the ice on the roads (a quarter inch of snow doesn’t constitute really being snowed in). Your bread makes me want to just shove my whole face in and rip out a big bite from the center. I’m sure it was fluffy and tender, but crunchy on the outside! YUM! And I love the oregano on top of the bread! Nice touch! That looks like a really great bread recipe. I’m going to give it a try for Sunday dinner this week. Love your rustic bread! I’ve never tried an ‘every day’ bread without yeast. Sounds quick, delicious and easy! Beautiful bread and a delicious-looking healthy soup! We’ve been housebound for days because of the snow, and I’ve been baking too, but I wish I had some of your bread! You didn’t just give us a couple of recipes, Kate. You just gave us all a window on your world. I can see it all through your beautiful photos and description! Can I just say, though – I’m SO GLAD that my kids didn’t have the day off the other day? It might be the first time I’ve sent them to school when snow lay on the ground. Seattleites can be such snow wussies! I’m so glad that I am able to give you all a glimpse of my life through this blog. Thank you for the wonderful words! 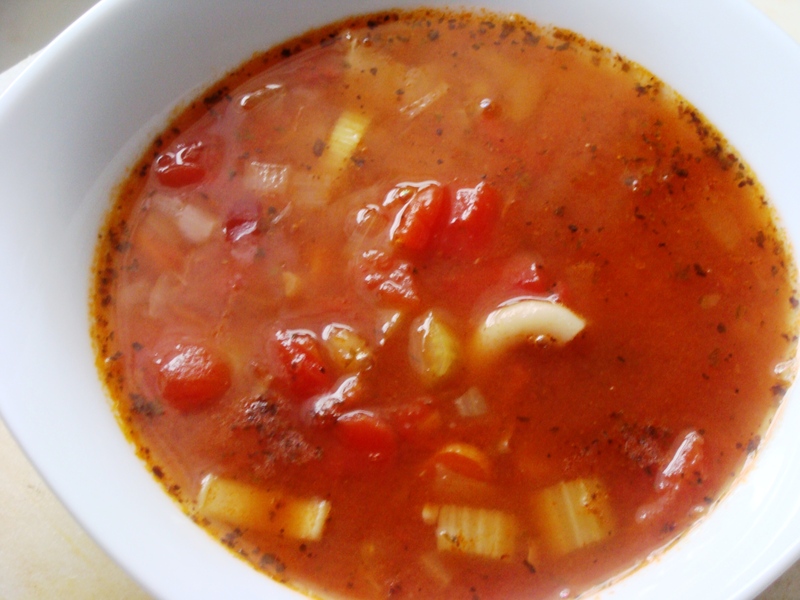 Your soup sounds so warming and flavorful, just perfect with freshly baked bread! Gorgeous! That bread looks soooo yummy! And I could take a swim in that soup, for sure! Only one snow day here, but we still managed to make soup too – chicken witth red lentils in our case. Your bread and soup, though, remind me of winter suppers when I was a kid. There were five kids in our family and my Mom made bread and soup on weekends when we could have it as we came in from playing in the snow. There was NEVER a scrap of bread left after a soup and bread supper! Thanks for the memory! WOW! That bread looks so easy! I am always intimidated by bread recipes because they usually involve yeast packets and complicated directions. But this… this I could follow! I hear ya! Today was day 4 of no school for me (I’m a teacher)! I had to brave the ice to go to Trader Joe’s yesterday! You can never have too much flour. I know I go through it at insane rates. 😉 Fresh bread and homemade soup….excellent meal. I love the looks of your bread. I ran out of bread yesterday and I’m trying to decide if I should buy some, or make some? I think I should bake! Thanks for the push! There is nothing better than homemade soup and bread for a snow day! Nothing better than the aroma of baked bread in your kitchen on a snow day! Looks wonderful! The title of your post grabbed my attention right away on this chilly day…What a perfect, comforting meal! what can be better than homemade bread and homemade soup! A feast for the body and for the soul! First, soup and bread looks so good and delicious..and I hear you about third day snow day..my kids are home for the last 4 days, and my pantry as well as fridge getting empty..I got to hit the store ASAP. LOL!